All additions available at checkout! 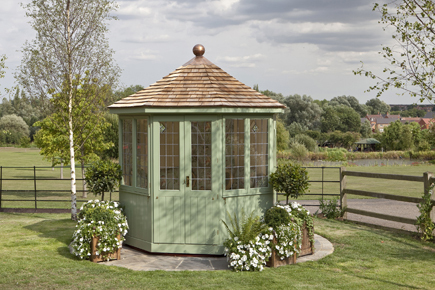 The octagonal Burghley Summerhouse is a larger version of the Baltimore Summerhouse and similarly includes a pair of glazed lockable doors and casement style windows. The doors and windows can be hooked open during a warm day and can be closed to provide the ideal garden hideaway when the temperature gets cooler. Available in three sizes: 2.4m, 3m and 3.6m width. Casement windows and lockable doors with safety glass and brass ironmongery. One piece lead-effect glass fibre roof or natural cedar shingle roof available on the 2.4m building. The 3m and 3.6m Burghley are only available with a cedar shingle roof. Optional sectional seating and upholstery, with integral storage space, as standard within the seating. Finished throughout in pressure treated timber, as standard, or choose from one of the Scotts colour finishes available. The Burghley summerhouse has three diamond leaded windows on the rear panels.